If you’re an airman at Hurlburt Field working out at the base gym and think you’re hallucinating because Lebron James or Dwyane Wade walked by — you’re not. The U.S. Dream Team Miami Heat will hold their weeklong training camp at Hurlburt Field and Eglin Air Force Base starting Sept. 28. Of course, the Heat dominated headlines this summer when James announced on a national television he planned to take his talents to South Beach instead of re-signing with the Cleveland Cavaliers. For good measure, Chris Bosh joined James and Wade to form what some are calling the best team since the Michael Jordan-era Chicago Bulls. Airmen will have a chance to watch some of the team’s practices and scrimmages, although space will be tight. Hurlburt’s Aderhold Fitness Center holds a maximum of 300 people. The team will close some practices to avoid allowing other teams from learning too much, said Master Sgt. Katherine Grabham, a 1st Special Operations Wing spokeswoman. The Heat plan to hold events on Hurlburt and Eglin Air Force Base, Fla., allowing airmen to meet and talk to the players, Grabham said. Lebron and Co. will not only practice on base, they will live on it. The players and coaches will live in the new billeting opened this year on the shores of the Santa Rosa Sound. However, you won’t find Wade inside the mess hall waiting for pancakes in the morning. The team will bring a kitchen staff to attend to the players’ specialized diets, Grabham said. In between workouts, the Heat players will also use Hurlburt’s weight room, so it’s conceivable you could look over and find some very tall individuals lifting dumbbells if you are assigned to Hurlburt. For those not impressed by NBA players and who just want to get a workout, the gym will stay open while the team is using it, Grabham confirmed. 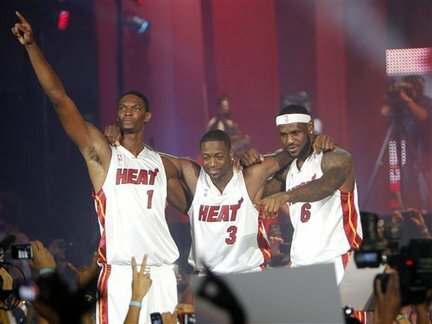 It’s a brilliant move by Heat president Pat Riley. What better way to shield the team from the circus that is sure to follow the Heat all year than hold training camp on one of the most restricted bases in the Air Force? Miami Heat vs All Air Force Bball team!!! Open to the public? Hellooo its a military base, unless you have a military ID no one is allowed on the installation. Security is no joke here..